Last year, we immersed ourselves into the world of adult scooting as part of our new role as Micro Scooter Ambassadors. For the past year, Sharon has been using the Micro Classic Scooter to get to work as well on days out when the terrain is safe to do so. Before the scooter, Sharon would get the bus straight to her destination, whereas now Sharon get’s off a few stops early and rides the rest of the way! One of her favourite activities to do with the scooter is ride on ahead of us, complete a 180 turn, and the ride back towards us as fast as she can – it’s like she’s a child again, but this time with an awesome ride! She is loving the thrill of the ride as well as the calories it burns! If follow us on Instagram, you’ll already know that I love Babywearing. Don’t get me wrong, I love our pram, and often get buggy-envy, but having T close to me is something really special. From the first time I went to a sling library, to the moment I got to grips with a woven, it’s been fun (in a sweaty, frustrating, why-won’t-he-go-any-higher kinda way). If you’re thinking of Babywearing, whether it’s via a stretchy or a buckle based carrier, here are my top 5 reasons why I choose to carry T.
T has been swimming with Puddleducks for quite some time now, with his first lesson starting back in June when he was just 2 months old. Every week, regardless of mood, we have fun learning how to swim and be water confident together. You can tell T always enjoys himself as more often than not he doesn’t want to get out! 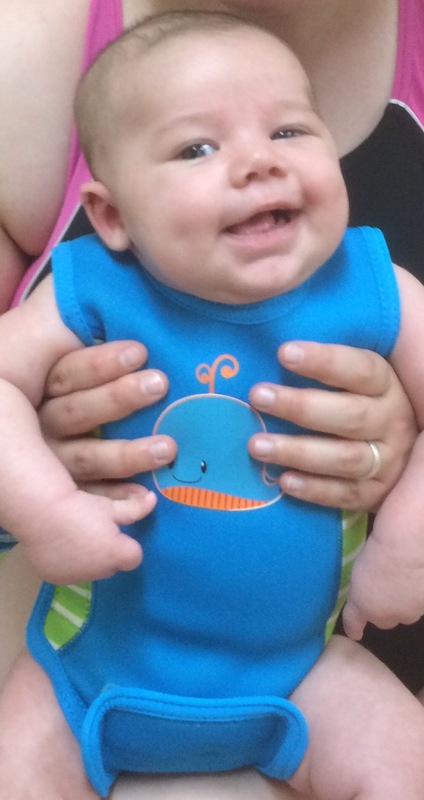 Looking back to when T first started, he was just a tiny baby in this huge swim suit; floating around the pool. Now, as soon as recognises Vicki; our instructor, he’s all smiles. As soon as he’s in the water, he splashes and kicks following word associations, holds onto the side when asked, and even swims underwater. We even had a Photoshoot done to capture this! Joining Puddleducks was one of the best things we chose to do together, which is why we want to give one lucky Floatie or Splasher (ages 0-15 months) a chance to win a free mini-taster term for May 2016*! During the taster term, you’ll learn how to confidently handle your baby in the water, as well as teach them the basics when it comes to water safety (and fun, of course!). For your chance to win, just follow the link below. Locations for taster term limited to Brighton Hilton Metropole, Ovingdean Hall, and Chailey Heritage School.